Emotional intelligence skills are key for academic and lifelong success. How? By integrating social emotional learning (SEL) as a central pillar of every school and university. Social emotional learning supports students and educators to develop and practice emotional intelligence skills and a process for teaching, learning, and practicing these skills. Attention to SEL helps everyone in a school setting develop 21st century skills for deepening awareness, choice, and purpose. SEL helps to create a school climate that is a great place to learn. Conducting, supporting, and sharing research on effective implementation of social emotional learning. Encouraging effective SEL implementation through Benchmarks for Social Emotional Learning. Supporting additional research through Six Seconds’ Grants. Equipping educators and ed faculty with certification training in tools and processes to fully integrate SEL. Connecting the community of emotional intelligence change makers. 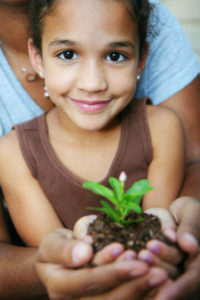 Download an overview brochure about Social Emotional Learning. 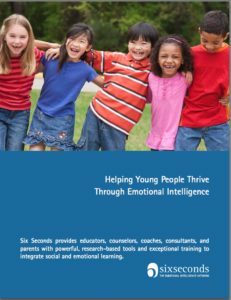 Members of Six Seconds’ community conduct research on best practices for putting emotional intelligence into action at all levels of education. Please click here for more details and recent articles. How do educators introduce emotional intelligence and develop a systematic approach to social emotional learning? The Benchmarks for Social Emotional Learning provide a framework for implementation, and a rubric to assess progress and plan next steps. To encourage research in all sectors, Six Seconds’ Grants provide assessments and technical support to projects all around the world. We believe that to effectively implement social emotional learning with students, first the adults need to develop and practice emotional intelligence themselves. Six Seconds’ certification training offers in-depth professional development for educators, parents, education faculty, and consultants working in education. 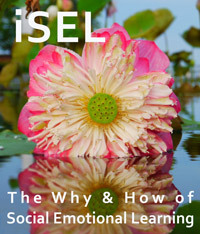 In addition, Six Seconds provides free eLearning and other resources to support social emotional learning, including the rich resource of ISEL, a comprehensive, free eLearning for professional development. While there is growing awareness of the importance of emotional intelligence in education, educators frequently express that they feel isolated as changemakers working to bring this essential ingredient to the forefront of schools. Through web meetings, local events all around the world, and social networks, Six Seconds supports a thriving community of practice. Visit the EQ Educators and Parents group on Facebook to say hello! Fill in the form and we'll email you the kit with SEL intro slides and the eBook to expand the conversation on EQ in education.